Conservative political activist Candace Owens made false claims last month that Yeezy designer Kanye West was helping her design an anti-democratic clothing brand called Blexit, which would encourage black Democrats to turn Republican. West, who was notoriously conservative last month, now claims he wants nothing to do with the brand. He has since attempted to distance himself from politics, claiming that he has been “used” to promote ideology he does not agree with. Sadly for West, that won’t change how the public views the Yeezy brand. Fashion has throughout time always been used as a creative way to make a statement, but never has that been more true than it is in 2018 in an increasingly political climate. With more brands and figures like West coming out and making their political views known publicly, the logo on your shirt can say a lot more than you might want it to. Regardless of whether West supports or denounces Blexit, the damage has already been done by his very public political statements. 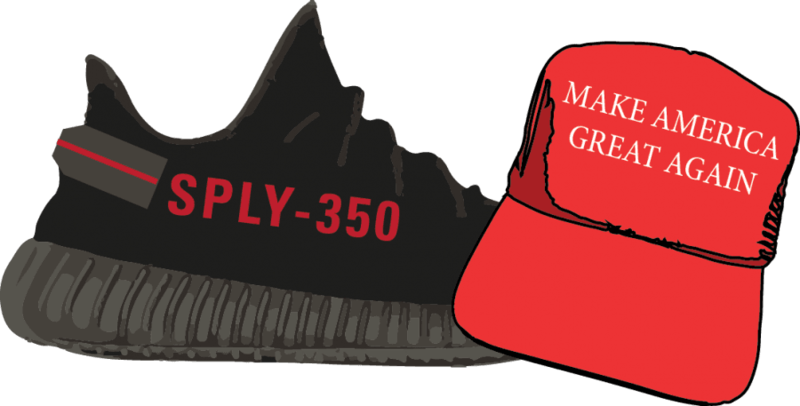 Yeezys are now essentially synonymous with MAGA hats, and the same goes for Nike’s synonymy with Colin Kaepernick and democrats. In the case of Nike, the brand represents the opposing opinion to that of the currently unpopular Kanye West. Its outward political display had mixed effects in terms of public perception. Though Nike’s stock has done well since the initial Kaepernick ad was aired, there was a 34 percent decline in favorability after the ad, and that decline includes millenials and other key demographics for the brand, according to a study by Morning Consult interviewing over 8,000 Americans. Some say that Nike’s stance is an important step in political progression. Nike has not only the resources, but more importantly, the people in power that support them. Their overall favorability may be down at the moment, but their liberal supporters have increased significantly and Nike’s stock is expected to see continual growth in the next coming years. While Nike is positioning itself as the Black Panther as Lorenzo said, other brands like Yeezy and Jordan remain behind on social issues. Chicago’s own Chance the Rapper even called out Jordan for being negligent of social issues in Chicago, posting a meme replicating the Kaepernick “Just Do It” ad, with a picture of Jordan and the words “F*ck them Kids” written across his face. While Jordan has remained mostly out of politics after famously saying “Republicans buy sneakers too”, other brands are starting to realize that his approach is growing dry. Last year, Adidas ran an ad campaign called “Calling all Creators,” which explored how athletes, artists and other tastemakers have an influence on culture through fashion. The ads brought together athletes like NBA star Damian Lillard and pop culture icon Pharrell Williams into the same room to discuss culture and content creation; these names are just two of so many more. Pharrell in particular very publicly filed a cease and desist letter to President Trump barring him from playing his music at any of his rallies, which led to a myriad of other artists like Rihanna to do the same. Rihanna and Pharrell are both fashion designers in their own respect; Rihanna founded her own Fenty Beauty brand and Pharrell has his own line of designer sneakers with Adidas. While Jordan remains on the decline, people like Rihanna and Pharrell are examples of how being outwardly political (and more outwardly liberal), can be good for business despite Nike’s favorability numbers indicating otherwise.